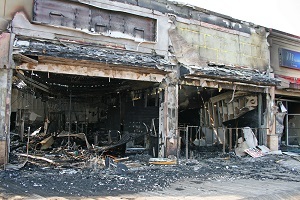 Filing a Commercial Claim for Fire Damage to Retail Stores | The Voss Law Firm, P.C. Will Your Insurance Cover the Full Cost of a Fire In Your Retail Store? When fire rips through a commercial building, the damage can go far beyond the loss of property and inventory. Water used to put out the fire may cause further losses, customers will go elsewhere for their needs as you make repairs, and the structure may be unsalvageable and need to be completely rebuilt. Attorney Bill Voss explores the most common causes of fires in retail locations and the obstacles owners may face when making claims. According to the National Fire Protection Association (NFPA), merchant and retail stores have the second highest incidence of fires of all commercial properties nationwide. A 2015 report from the NFPA found that fire departments respond to over 13,000 fires in stores and retail properties every year, and these fires result in roughly $604 million in property damage annually. The more higher the concentration of inventory, the more likely it is for a location to suffer higher property damage costs. Electrical failure. The most common cause of fires in storefront businesses is electrical malfunction. About a third of fires that result in direct property damage to stores are caused by electrical equipment, such as faulty appliances, fuse boxes, or wiring. Cooking equipment. While cooking equipment remains the leading cause of fires in restaurants and bars, retail locations that are equipped with coffee makers, toaster ovens, microwaves, or other appliances are at risk of fires caused by these devices. Employee misconduct. Workers contribute to fires in many ways, especially if they do not receive proper fire safety training. Employees who do not know how to operate fire extinguishers, follow fire alarm and evacuation procedures, and identify potential fire hazards all increase the risk of a fire on the property. Arson. Retail locations have a higher rate of intentionally set fires than other types of businesses. Insurers will often deny claims if it discovered that the fire was started intentionally. How Much Will I Receive in My Commercial Fire Insurance Claim? There are several types of commercial fire damage coverage, and each one has specific limits on the kinds of losses that will be reimbursed. There may also be exclusions in the “fine print” of your policy that bars you from claiming demise in certain cases. Fire damage coverage. Generally speaking, the higher your premiums are, the greater the scope of your coverage. Basic coverage may only allow you to recover property damage costs—and even then you may only receive the actual cash value (ACV) of the losses. A more comprehensive policy may pay for business income losses, upgrades in building codes, business relocation during construction, and other out-of-pocket costs. Fault and risk management. In most cases, a policyholder’s fault will not affect the ability to file a claim, but it can greatly affect the amount of coverage received. Just as an insurer is unlikely to pay for a fire that was caused by arson, it may have more grounds to deny or underpay claims that involve negligence on the part of the policyholder. If you failed to perform fire safety inspections, did not provide or maintain fire extinguishers, or take reasonable steps to prevent the fire, your insurance company may be willing to offer you much less than the full amount of your claim. Fire prevention and suppression systems. All business owners have a duty to prevent fires and limit losses when a fire occurs. Since large-loss fires in retail stores are most likely to happen when the store is closed, owners should install and maintain adequate fire alarms and sprinkler systems to mitigate the damage before the fire department arrives. Owners also have a duty to minimize losses after a fire occurs by pumping out excess water and clearing debris as soon as it is safe. If you are not sure what damage is covered under your commercial fire policy, we can help. Simply fill out the form on this page today to contact the Voss Law Firm or order a free copy of our book, Commercial Property Owners Must Read This BEFORE Filing an Insurance Claim.